an author named Barry Esterbrook who’d written a book called Tomato Land. shipped green from Florida, and turned red by exposure to ethylene gas. fascinating were his reasons why "real" tomatoes taste so good! proportions to get a good tasting tomato." to give us tomatoes! And of course, it will be difficult for scientists to catch up. seedlings, tearing up weeds or picking fresh fruits and vegetables. tomatoes only need to be watered about once a week and only if the soil is dry. color, taste, size and shape. 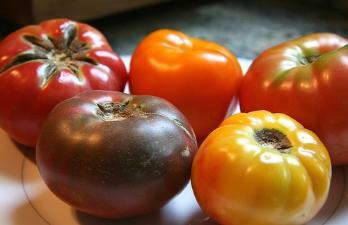 possess some health benefits, heirloom tomatoes are superior. required to obtain the same amount of tomatoes. ground gives them a head start on building a root system. growing multiple varieties of heirloom tomatoes. at Cooks and Travel Books.